In the aviation industry, effective communication is crucial to maintaining an efficient and effective operation. However, a harsh reality for many organisations is that communication processes are often complicated and time-consuming, taking up valuable staff time from key areas throughout their operations. So when we introduced Read&Sign to Humberside International Airport, Operations Manager Chris Wild saw the benefits immediately. A large part of Chris’ job requires him to manage Humberside Airport’s Safety and Quality Management Systems, ensuring that a wide range of Humberside’s employees are kept up to date with the latest policies, procedures and safety information. Before Read&Sign was introduced at Humberside Airport, the process of updating personnel, suppliers and services involved heaps of paper production, wasted time spent collating signatures and the stressful job of chasing people down to ensure that they had received (and understood) the various important messages sent out to different departments on a day to day basis. Now notices, policy updates, important documents and much more are authored and distributed via Read&Sign’s system, with clear statistics available online to show who has, and more importantly, who has not read and acknowledged them. Not only are Humberside Airport’s own users connected to Read&Sign, but also external operators including Eastern Airways, Bristows Helicopters, Fire, Police and Ambulance services, catering companies, retailers and local councils – all of whom benefit from an efficient and effective operation at Humberside Airport. We’ve thoroughly enjoyed working closely with Humberside Airport to implement Read&Sign, and it has been a pleasure to see just how much our system has improved their internal communications with increased efficiency and reliability. 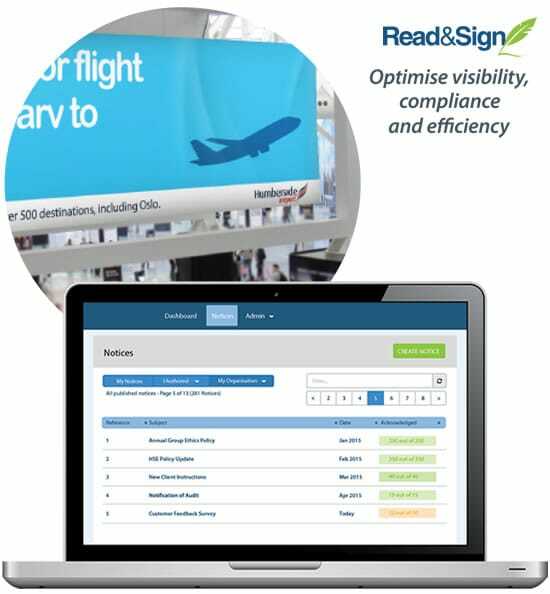 Moving forward we are already in the process of bringing Read&Sign to even more International Airports across the UK as well as a variety of organisations outside of aviation. This provides us with more opportunities to develop new modules for specific sectors and to provide a roadmap of useful enhancements for the near future. If you would like to read about Read&Sign in more detail, please visit our Read&Sign software page or if you would like to chat with us about how Read&Sign will work for you, please get in touch – we would love to learn more about you and identify opportunities to improve communication in your organisation. ” Since using Read&Sign as a communication tool, it has fulfilled several elements of our SMS requirements; namely communication efficiency. We find it a very useful tool that enables us to monitor our communication efficiency and check timeframes for acknowledgment. The system does however allow various ‘add-on’s and we are looking at making best use of the system. Such ‘add-ons’ could be an auditing module, action tracker module, risk database module and also a document library. Fill in a few details about your software requirements and our team will get straight back to you.